… which means I forgot that December has 31 days! 😛 Never mind – I’ve the perfect background music-video for us to listen to for this, and any other year. So what’s a book trailer? Well, it’s kind of like a movie promo trailer – and they can help you let the world know what sort of book you’ve unleashed! … and then leave a comment on the video page and you might be the lucky winner in the prize draw for one of these fab freebies! 1st – Amazon Gift Voucher! Want to know more about ‘Befouled’? for excerpts and other geeky factoids about the Ordha Universe and its origins…! Do YOU wish it could be Christmas every day?! (it’s also the Freebooter’s Fantasy Almanac festive book trailer party today)! Let’s get this started in the Christmas spirit first! And now down to business! What’s a book trailer I hear you ask? Well, it’s kind of like a movie promo trailer – and they can help you let the world know what sort of book you’ve unleashed! 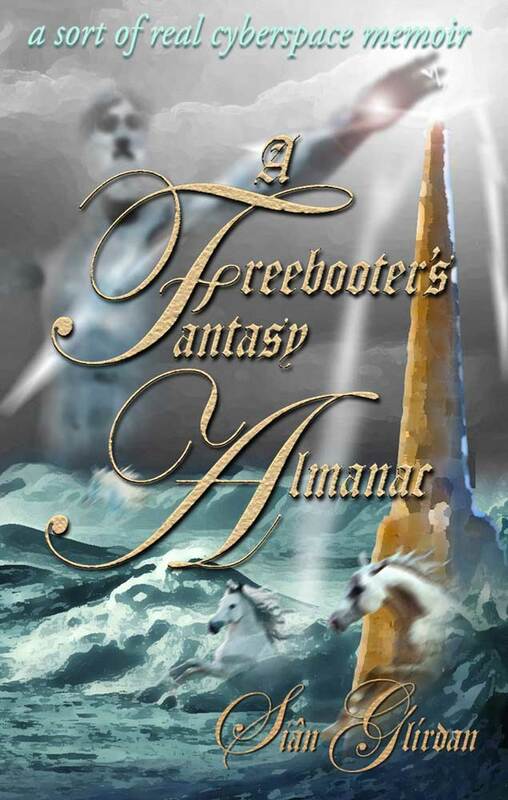 Want to know more about A Freebooter’s Fantasy Almanac? for loads more info and photos of the people and places that all mix in to make the Freebooter’s EXPERIENCE! Thank you & have a lovely festive day! Here’s one of Lisa Burton’s (the Robot Girl) radio interview with Dan Forster aka Christine Cooper, his magical alter-ego who keeps him legal… and whose feminine namesake is helping him with a Gellboar problem! Hey there, all you downtrodden folks. Those who’ve been repressed by unfair rules and regulations. You’ve landed on Lisa Burton Radio, the only show that interviews characters from the books you love. I’m your host, Lisa the robot girl, and I have a treat for you today. Welcome all you secret society members and sequestered royal families. This is Lisa Burton Radio. The only show that brings you the characters from the books you love. I’m your host, Lisa the robot girl, and today we’re going to peek inside a clandestine operation that protects one of the world’s royal families. News on the business side of things… Read on for more news on the update of the DreamWorlds Publishing website and writer services coming up! The eleventh hour, of the eleventh day, of the eleventh month, is marked by nations around the globe, usually in as part of Remembrance/Armistice/Veterans memorial day, but in particular to mark the end of fighting on the Western Front of The Great War on the time and date that the peace accords were signed in a railway carriage at Compiègne, France. I’m deliberately referring to WW1 as ‘The Great War’ in this context, because its Armistice marked the end of devastating fighting and massive mortality amongst the military and civilians that literally changed the world, politically, socially, economically and, most of all, psychologically. “My Lord? I am curious…” her question faded away as his silvery eyes looked keenly at her. For a moment, her own dull red gaze dropped away. “Ask whatever you wish, Eiralann – I am here to help you as much as I can.” Again, he restrained himself from examining her thoughts. Instead, he smiled at her in encouragement. In turn, he tailed off, taking time to choose his next words. As she spoke, he gave her a slow smile, for he often wondered since she had been passed into his care, whether he should speak to her on this matter. With a wry nod, he began to explain a little of what was in store for the Creedhor. “Like HE did!” Her eyes flamed now, hot as translucent rubies and her voice was a snarl at the thought of all she had been subjected within the Iron Tower. “Now you are restored and no longer being fed poisons, your will and your mind will never be overcome by those means again. Nor will I, nor my kind, try to dominate you in such a way without your consent. The future Eiralann in the Forest Kingdom? Image by Wayne Reynolds on Pinterest. Here’s that editorial review of Befouled now – Sue’s a Tolkien lore expert, so I’m tickled pink with this! Siân Glírdan has managed to terrify and enthrall me with this book. Her depictions of the beings of Evil at their cruel work are chilling, and the story fills me with pity and sorrow at the suffering of the captives and thralls. They say love will always find a way, but this story takes its protagonists to hell – and not necessarily back again, at least not completely. What if the only way to show your love is an act of evil? A devastating tale, that made me cry out in shock at times. Produced from imaginative depths that I envy. Howling at the memory, she hugged herself into a cringing, knotted ball of humiliated self-recrimination. She had literally spat the meat out back into the fire, gagging in disgust at the hot fat and dried-up taste. She ejected the bones as well and again she wailed as she recalled how she had attacked the fire, ignoring the burns to her hands. Trying desperately to pull the scrawny pelvis away from those ruinous flames. It had taken both Dughal and Aerghal to pull her away and stop her doing herself any more harm. And what had she done? Spat at them too. Cursed them with words, they could not understand but discerned the meaning of well enough from her blazing eyes, glowing like red-hot coals. Her mouth and face had contorted into a snarling mask of frustration and hunger as she hit out at them, scratching and punching like some demented animal. In the end, the two males had managed to subdue her, and she wept once more as she saw the scratches and bruises on their faces that she had inflicted on them. Sûlranna’s children were crying as well, across the scattered fire where their mother rocked them, stroking them tenderly into calm again. The sight of the woman and her children wounded Eiralann as nothing else could, so she had turned her face away from Dughal as he asked what she had been thinking of. And still, he was not angry with her, only worried and confused. Aerghal, understandably, was not quite so conciliatory and had addressed her more sternly. “So sorry! I am so sorry!” She shuddered with self-loathing and faintness now as her empty stomach growled in protest and yearning at the food it no longer tolerated yet still ravened for. Her voice was virtually incoherent as she struggled to command herself once more. Aerghal’s look of outrage had begun to soften and echo Dughal’s worried concern as they both realised the depth of her contrition and fear. “What is it, my sister? What has been done to you by these… wild beasts you lived with?” Again, he laid his hands on her, more gently this time, but still strong enough to keep her from trying to evade his touch. Holding one of her arms tightly he reached out for her chin with his other hand and made her turn her head to face him. “Eiralann. Look at me. Open your eyes.” The years of enforced obedience took over, though he spoke far more kindly than her old oppressors had ever done. Gradually her eyelids opened, and Aerghal looked deep into the now dulled garnet eyes and saw her fear, the humiliation and despair and profound sorrow. And the terror. “I remember you now… you were Shiânford’s mate were you not?” She had no knowledge, no memory of him from before, but she knew he was right. He had known her. Known Shiânford better. She could not speak, but she did not need to. He saw his answer in her eyes, no matter how much they had been changed. His gaze was compassionate now, and his hand on her arm was gentle as his fingers stroked her too pale skin. He let go of her face so she could bow her head and cry silently now with exhaustion and shame. “He was my good friend once, but he left the Lake. Said it was not safe anymore. Not safe for you and your unborn child… Oh, my dear! What happened? What happened to him and to your child?” Aerghal stopped as Eiralann began to utter great quivering sobs. He pulled her deeper into his arms, despite her weakened struggling to get away, rocking her back and forth until her weeping began to ease a little. “But you were not Eiralann then… You were Fae… something…” He spoke softly to her now and loosened his hold, letting her move away from him a little. He dipped his head trying to look at her again, but this time she would not meet his grey-eyed gaze. He stared at her as though she was mad. How horrific do you like your horror genres to get? My gameplaying avatar for Aeglos/Eiralann in her latter days in Rivendell as a guardian ranger. They all knew her well enough, though she kept herself pretty much apart and seldom spoke to others beyond the necessary, not even to those Guardians whom she rode with or shared patrol duty. Her diligence and energy in tracking and especially killing orcs was legendary in Imladris, even equal to Nurbor’s. Most thought he was her friend, though when they thought a little more, it would be readily conceded that they were more like old comrades-in-arms. They certainly went back a long, long way but only Nurbor knew how long and the Lords Elrond and Glorfindel might have hazarded an informed guess too. So although she did not join in the quiet conversations or cameraderie that some of the others indulged in as they made their own preparations, nobody was surprised that she had answered the summons as she silently made her horse ready for the ride north. She was ready and waited patiently for Glorfindel to come and brief them, standing by her mount and stroking its nose continuously, learning its name and nature in the way of the Eldar. Aeglos loved horses but she had none of her own and generally never used the same animal twice to ride to battle although she sometimes rode the same horse for patrolling the Valley. She did not look at the others, they were no concern of hers not unless they got in her way. They called her Aeglos, the Snow Thorn to her face at least, but she knew the other names they had for her when they thought she did not hear – the Ghost, or worse, the Lady of the Skulls. Not that she cared much, for they were right in a way. Even Aeglos was not her real name. Or not her original name. That elleth was long dead to everyone. She tied her long bone-white warrior braids behind her head away from her pallid white face and finally her dark-eyed gaze swept around the stables looking at others just arriving, wanting the Lord to hurry so they could get on the road. Some of the younger Guardians looked back at her, but not for long. She was still beautiful but her appearance, bereft of the glowing light that all the rest of their race possessed, repulsed most other Elves. Repulsed herself too sometimes when she caught sight of her reflection. It had not always been that way, but that too was long ago. So long. Where was Glorfindel? She wanted to be gone from here. Aeglos was hungry for battle now. Ready to kill. Ready to die. She was always ready for that, but it never came. Not yet. Maybe this time it would come, if she prayed hard enough. Nurbor is the original identity for Dughal, modelled on a good friend’s ‘in character’ warrior persona, whose unrelenting war against Morgoth’s creatures ran parallel and complementary with Aeglos’ own, though with a different, less ancient back story. I learned loads about playing warriors from Nurbor and Bran, his real life player, for which I am eternally grateful! How do you like to develop your characters?